In this volatile market, which is the better consumer staples play? Check out the latest Clorox and Colgate-Palmolive earnings call transcripts. In times of market volatility, stock investors tend to run toward the companies behind consumer staples. The companies selling products that people buy over and over as part of daily life aren't the most exciting investments on earth, but in times of uncertainty, their steady household product brands and investor dividends become highly appealing. Staples stocks often remain relatively stable in market downturns -- at least relative to cyclical and technology stocks, which is why this sector may be attractive today. Two of the heavyweights in the U.S. consumer staples sector are Clorox (NYSE:CLX) and Colgate-Palmolive (NYSE:CL). So which is the better stock for your investment dollars today? Each company has a wide collection of household brands you likely use regularly. Clorox obviously has its namesake Clorox bleach and cleanser brands, along with Kingsford Charcoal, Glad trash bags, Pine-Sol cleaners, Fresh Step cat litter, Brita water filters, and Burt's Bees lip balm, among others. Colgate-Palmolive of course has its namesake Colgate toothpaste and Palmolive dish soap, along with Speed Stick deodorant and Irish Spring soap and others. Like Clorox, Colgate also has a pet division, but instead of cat litter, Colgate sells pet food and nutrition products under the Hill's pet food brand. As you can see, the companies have some competing products in soaps, but also operate in different segments, such as charcoal for Clorox and toothpaste for Colgate. Colgate is one of the oldest companies in the U.S., founded all the way back in 1806 in New York. By comparison, Clorox is a spring chicken at just 106, founded in 1913 in Oakland, California. Key questions for investors to ask include: What is each company's dividend yield, how expensive are the stocks on a P/E basis, and how are each company's growth prospects looking? 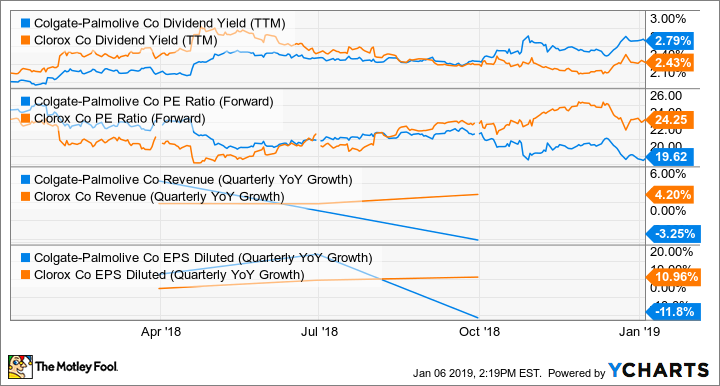 As you can see in the chart above, Clorox appears to be trouncing Colgate-Palmolive in terms of its revenue growth and EPS, but also sports a slightly higher valuation and slightly lower dividend yield. Let's dig in further to see the causes behind these metrics. Clorox and Colgate are dealing with some of the same headwinds affecting all consumer products companies. Namely, a spike in freight costs, rising input costs, and a strong U.S. dollar. The strong dollar has been especially bad for Colgate, which generates only 22% of its sales from North America. While North American sales were up 8% last quarter (mostly due to a 7.5% price increase and the acquisition of PCA Skin and EltaMD last December), all its other markets were starkly negative, despite price increases. In contrast, Clorox gets a majority of its sales from the U.S., with only 15.3% of its sales from international markets last quarter. That led to a 2% hit from foreign currency, but even with that, Clorox was able to grow 4% -- though 3% of that was from the acquisition of Nutranext last May. Nutranext is a seller of vitamins, minerals, and health supplements, further adding to Clorox's portfolio of consumer brands. However, even correcting for foreign exchange headwinds, acquisitions, and divestitures, Colgate's "organic" sales were down 0.5%, and that's with an average 1% price increase. That's in contrast with Clorox, whose volumes were strong in line with overall sales. So, even adjusting for emerging market woes and currencies, it appears Clorox is still outperforming Colgate. Though Clorox's sales and earnings were up strongly, its earnings beat was largely the effect of tax reform, as well as company streamlining initiatives. Its gross margin, however, was down 150 basis points last quarter, as freight and commodity costs rose strongly. The company won't get the benefit of tax reform again this year, which means it will have to work out its gross margin issues in 2019.
Colgate's slightly lower valuation (19.62 forward P/E vs. Clorox's 24.25) and slightly higher dividend yield (2.79 vs. 2.43) isn't enough to earn my confidence. I am also still very nervous about overseas markets, where Colgate gets a majority of its revenue. While Colgate could be in for a much bigger rebound should things change, I'm not sure that is going to happen in 2019. So while Clorox has a slightly lower dividend and slightly higher valuation, its U.S. orientation and better organic growth execution seal the deal for me. Unless you feel like making a risk-on upside bet on Colgate (which you probably shouldn't be doing with a consumer staples stock anyway), stick with Clorox.